Each Christmas Eve our family gathers on the couch to read two books together. The first is “How the Grinch Stole Christmas” and the other is “Twas the Night Before Christmas”. We read from the book that my husband read from when he was a child…which I think makes it even more special. We love the positivity of the Whos down in Whooville. Their love for each other teaches Grinch the powerful lesson that as long as we have each other – we have everything we need. Whisk together the flour and salt in a large bowl. Make a well in the middle and pour the oil and water into the centre of the well. Use a wooden spoon to stir all the ingredients together, until the dough forms. 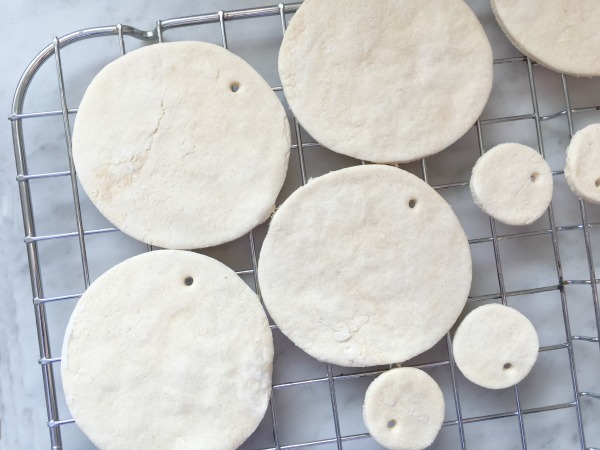 Roll out the dough on a lightly floured surface. Roll to about 1/8″ thickness. Cut out at least 5 large circles and 15 small circles. 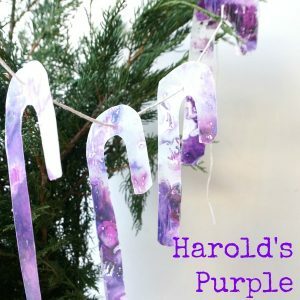 Use the straw to cut out a hole for the ornaments to hang from. Bake the ornaments on a baking sheet, in a 250°F oven for 2 hours. Remove from the oven and let cool on a rack. Once cooled, it’s time to paint. We chose to paint the small ornaments a variety of pink, green and white. 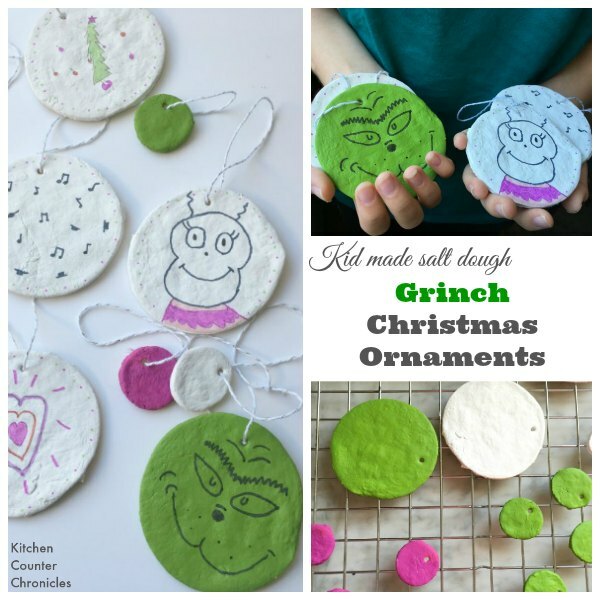 For the large ornaments we painted one green for the Grinch and 4 white for our other designs. 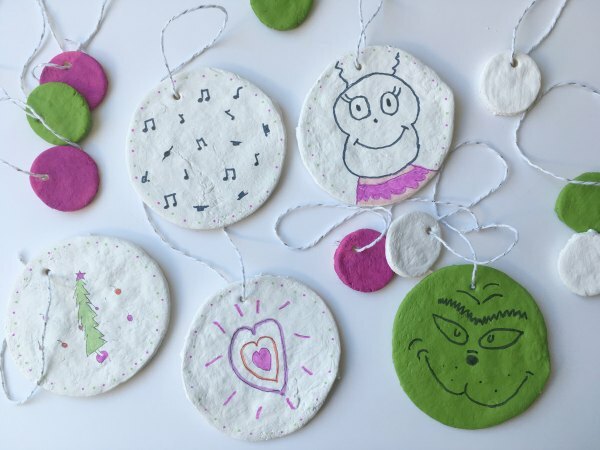 Have the kids draw the designs onto the ornaments with pencil, before using the markers. My girls decided to make a droopy Christmas tree, Cindy Lou Who, the Grinch’s heart, music notes and I made the green Grinch. Let the ornaments dry and coat with clear Modge Podge to seal the the ornaments. They will last for years once they are sealed. When the ornaments are dry, feed the string through the holes and hang the ornaments on your tree. 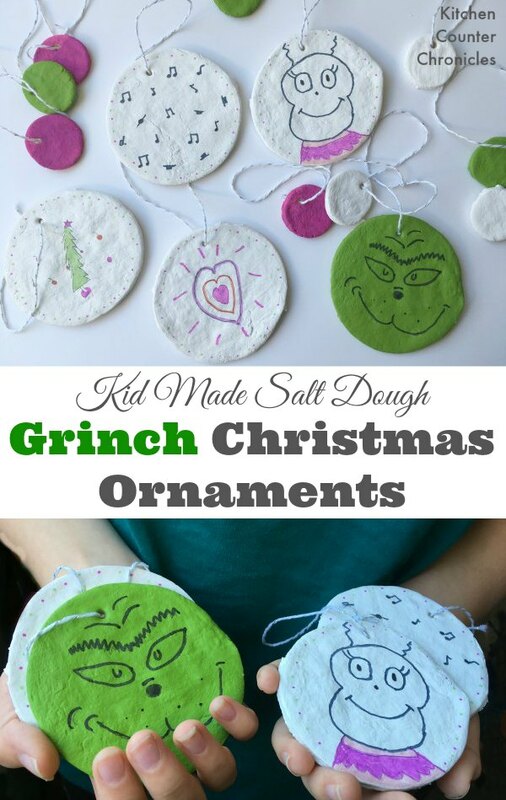 We will be clustering our Grinch ornaments together on our tree. Creating a little Grinch scene. 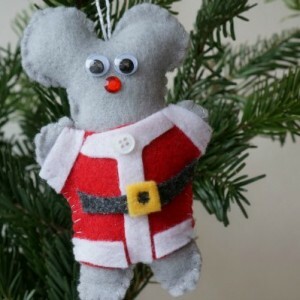 This Christmas craft activity would be great for a holiday party or a classroom holiday activity. 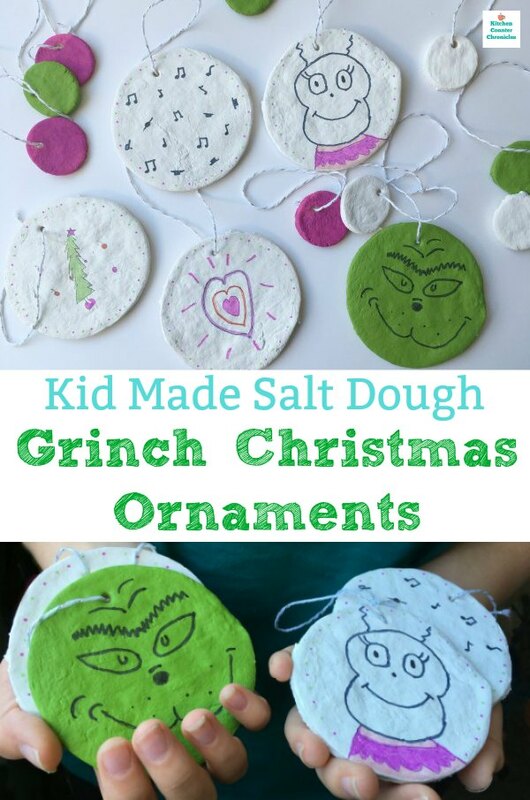 Bake up the ornaments ahead of time, read the book and let the kids create their own ornament designs. Using the markers made the images clear and crisp…as opposed to using paint. 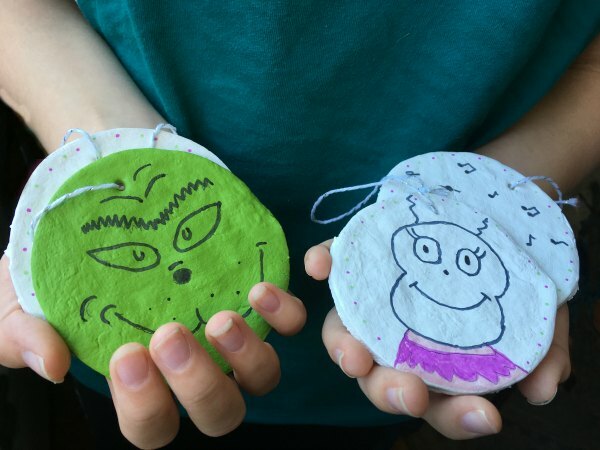 In the end, we love our Grinch-tastic ornaments. 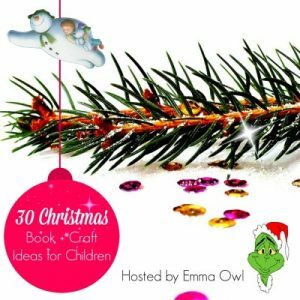 Today’s post is part of the Christmas Book and Craft Ideas for Children series taking place on Emma Owl. Please head over and take a look at all the other fun holiday books and craft activities being shared. How cute are these avocado seed snowmen from Uno Zwei Tutu. Make your own little fir tree with inspiration Emma Owl. OH WOW!! These are FABULOUS! 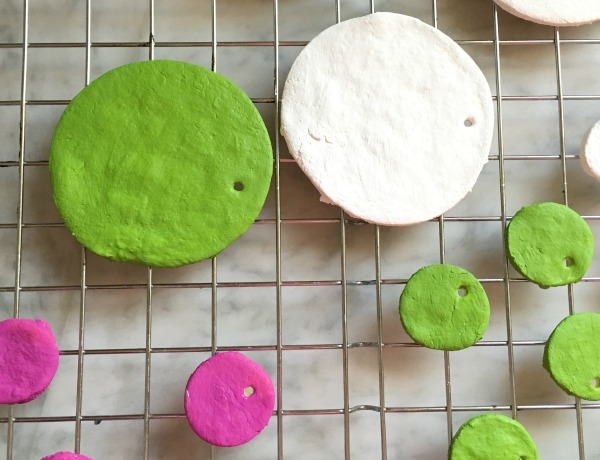 I love them – Just ANOTHER reason to LOVE salt dough! !